News & Resources / News / Toronto & York Region Labour Council: Bill 148 Is Good For Workers And It Could Be Better! Toronto & York Region Labour Council: Bill 148 Is Good For Workers And It Could Be Better! The Toronto & York Region Labour Council has created a shareable information poster highlighting the importance of the provisions in Bill 148, the Fair Workplaces, Better Jobs Act, and why these changes are vital to ensure decent jobs in this province. The legislation, which is currently proceeding through the public hearing process, with adoption scheduled for fall 2017, improves labour law and employment standards in Ontario, and increases the minimum wage to $15 by 2019. Nearly every family has someone whose working life will be improved if Bill 148 passes, but these gains may be in jeopardy, as some employers have launched public efforts to weaken the bill. Download the poster below and share it with your friends, family, neighbours, and colleagues, and ask that they do the same. 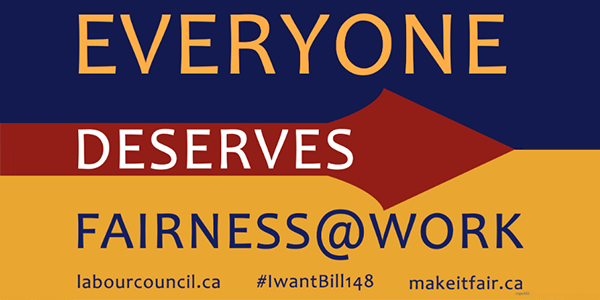 Contact your MPP and ask them to support and improve Bill 148. Visit MakeitFair.ca to send a message. Visit Queen’s Park and send a message on the final day of public hearings on Friday, July 21, 2017. Together, let’s restore balance in the workplace, so that people’s rights are respected and standards are raised.